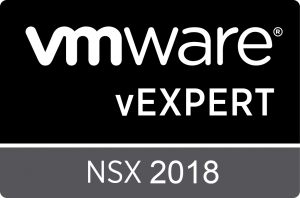 As of March 29th, the long anticipated NSX 6.3.6 release is now available to download from VMware. NSX 6.3.6 with build number 8085122 is a maintenance release and includes a total of 20 documented bug fixes. You can find details on these in the Resolved Issues section of the NSX 6.3.6 release notes. Since confusion with multiple DVS switches is something I’ve run into with customers in the past, I’m happy to see that this is now being enforced. As part of the upgrade process, a backup file is saved to the local filesystem of the NSX Manager as an extra bit of insurance. It’s important to note, however, that this does not remove the need to backup prior to upgrading. Consider this the backup of last resort in case something goes horribly wrong. Another point to note is that NSX 6.3.6 continues to be incompatible with upgrades from 6.2.2, 6.2.1 or 6.2.0. You can see VMware KB 51624 for more information, but don’t try it – it won’t work and you’ll be forced to restore from backup. Upgrading to 6.2.9 before going to 6.3.6 is the correct workaround. I covered more about this issue here in a recent post. This one is self-explanatory – not the expected amount of downtime to experience during an edge upgrade, so glad to see it’s been resolved. I hope to write a separate post on this one, but in short, some loop prevention code was removed in 6.3.5, and because the AS PATH is stripped with private BGP autonomous systems, this can lead to loops. If you are running iBGP between your DLR and ESGs, this isn’t a problem, but if your AS numbers differ between DLR and ESG, you could run into this. In 6.4.0 a toggle switch was included to avoid stripping the AS PATH, so this is more of an issue in 6.3.5. As always, if you are planning to upgrade, be sure to thoroughly go through the release notes. I’d also recommend taking a look through my recent post ‘Ten Tips for a Successful NSX Upgrade’.